Police and lawyers are to consider whether some outspoken Islamist radicals could face treason charges. The Crown Prosecution Service's head of anti-terrorism will meet Scotland Yard officers in the next few days. 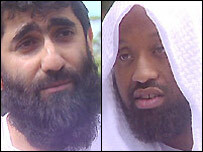 Omar Bakri Mohammed, Abu Izzadeen and Abu Uzair are all expected to come under scrutiny. But the government's reviewer of anti-terror laws, Lord Carlile QC, said he did not think it would be appropriate to bring treason charges. Attorney General Lord Goldsmith and Director of Public Prosecutions Ken Macdonald have discussed action against three people. A spokeswoman for the attorney general said it was not clear at this stage whether there was enough evidence to bring charges. The crime of betraying one's country has long been regarded as one of the most serious of offences. Treason carries a penalty of life imprisonment. The death penalty for the offence was abolished only in 1998. Government officials will be looking at broadcast and published comments as well as speeches and sermons made by the trio to followers. "No decision on charges has been made yet. The CPS will be looking at it to see if any offences have been committed," she said. The Tories have suggested the review has been sparked by politicians rather than by law officers. But Tony Blair's official spokesman said: "It is not a case of telling anybody what they should be doing. It is about looking at the options we have." Possible charges which will be considered include the common law offences of treason and incitement to treason. Lord Carlile said he would be surprised if treason charges were used. "I don't think there is a lawyer still alive and working who has ever appeared in any part of a treason case," the Liberal Democrat peer told BBC News. Treason usually applied to wars between nations, he said. Lord Carlile argued existing laws could be used, such as charges of solicitation or incitement to murder, commonly seen in contract killing cases. He said new laws had to be proportional, enforceable and understood by the general public and those who could fall foul of them. The ex-leader of al-Muhahjiroun, Anjam Choudry, attacked the idea of treason charges. "On the one hand the government says you have freedom of expression, but on the other it wants to backdate things that people have said so they could face criminal charges, which is a betrayal in itself," he told GMTV. News of the treason talks prompted Conservative home affairs spokesman Edward Garnier to accuse ministers of confusion and sending "mixed signals". One day they had announced planned new laws, now there were talks over using existing laws, he said. 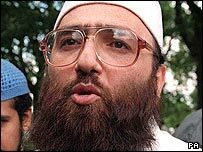 Of the trio facing scrutiny, Omar Bakri Mohammed is a London-based cleric for the al-Muhajiroun group, whose successor group, the Saviour Sect, is being banned by the government. Mr Bakri caused controversy when he said he would not inform police if he knew Muslims were planning a bomb attack in the UK. He also expressed support for Muslims who attacked British troops in Afghanistan and Iraq. British-born Abu Izzadeen, a spokesman for the group al-Ghurabaa [the Strangers] has declined to condemn the 7 July London bombings. He told BBC2's Newsnight the bombings were "mujahideen activity" which would make people "wake up and smell the coffee". Abu Uzair, a former member of al-Muhajiroun, told the same programme that the September 11 attacks in the US were "magnificent". He said Muslims had previously accepted a "covenant of security" which meant they should not resort to violence in the UK because they were not under threat there. "We don't live in peace with you any more, which means the covenant of security no longer exists," he said.